Mammals are one class of animals that have backbones, are warm-blooded, breathe air and whose females have milk-secreting glands for their young. In the class Mammalia, there are over 5,000 species of mammals, ranging from the 2-inch shrew to the 120-foot whale. 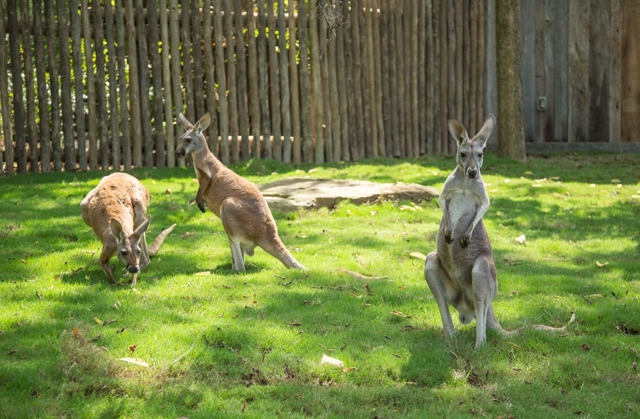 Below are the mammal species that call Nashville Zoo home. Long ago, alpaca had a very wide range of habitat in South America that began to shrink with the arrival of explorers. Alpacas can come in up to 22 colors. A dominant male alpaca will have a group of up to 10 females and breeding will occur once a year with 1 calf being born. Alpacas have been domesticated and are popular on farms for their fur, which is sheered similar to sheep. 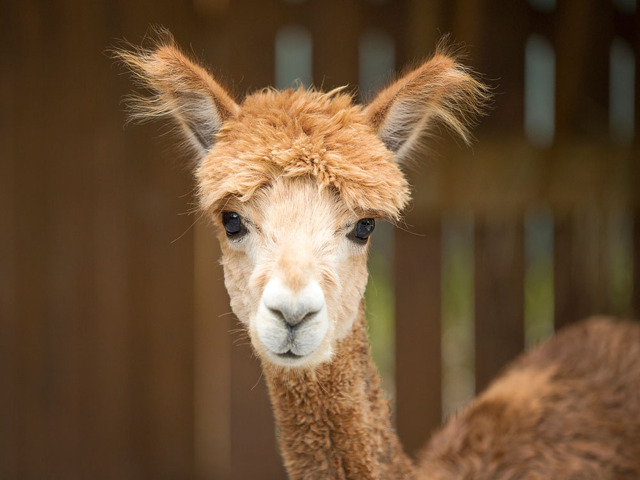 You can see our Alpaca in Critter Encounters. Andean bears, sometimes known as spectacled bears, can be recognized by the rings of lightly-colored fur around their eyes and are the only bears native to South America. They are considered to be the most herbivorous of all bear species, as well as the most arboreal, searching for food in trees and building leafy platforms to feed and sleep on. These bears play an important role in forest ecology because of their diet: as they travel, they disperse seeds in their droppings, maintaining the presence of fruit trees in the forest. You can see our Andean bears in Expedition Peru: Trek of the Andean Bear. 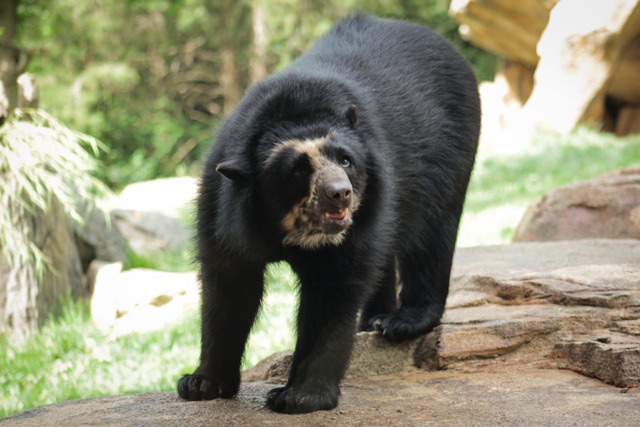 Nashville Zoo is a strategic partner of the Andean Bear Conservation Alliance and financially supports Andean bear conservation through the Andean Bear Conservation Alliance and the Wildlife Conservation Network. We also participate in the Andean Bear Species Survival Plan®. Baird’s tapirs are one of four species of tapirs. Three species live in Central and South America and one species lives in Asia. The upper lip of the tapir forms a proboscis similar to an elephant’s trunk. This is used to help them collect their food as they browse. Tapirs are born brown with white stripes and spots to help with camouflage and turn solid brown with age. 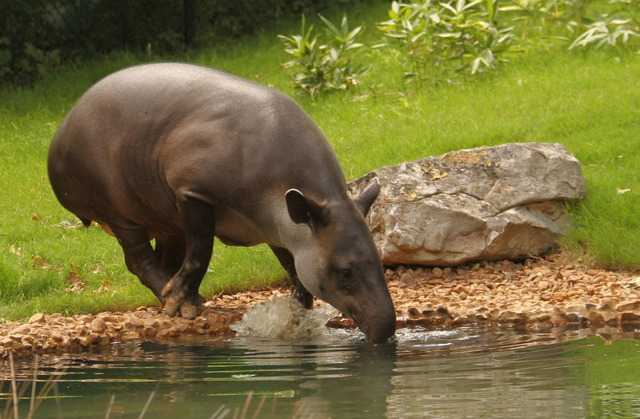 Tapirs will poop in nearby bodies of water to hide their scent from predators. 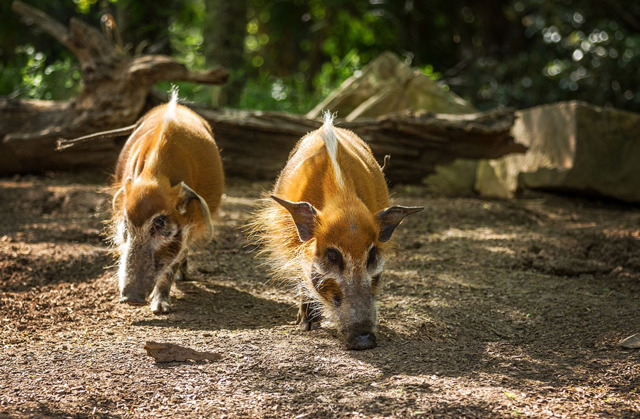 You can see our tapirs along the Jungle Loop. We participate in the Baird's Tapir Species Survival Plan®. Belted galloway were first brought to the US in the 1930s. Belted galloway are known to grow larger and produce more milk than other breeds and can sustain colder climates on marginal grasslands. They are also known for their high quality beef. The origin of the coloration is unknown but the white belt can vary in width. Belted galloway will grow a shaggy coat in the winter. 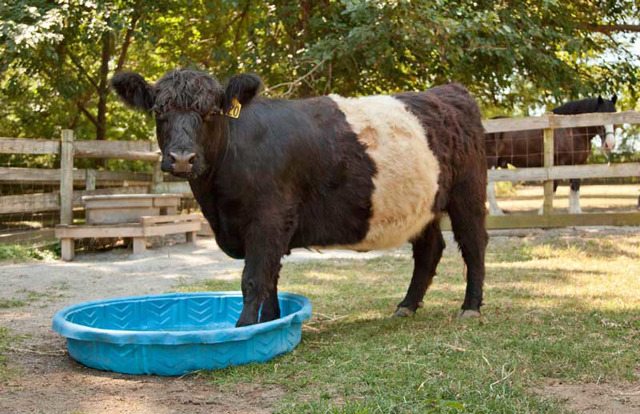 You can visit our belted galloways at the Historic Farm. The bontebok was nearly extinct in the wild but the creation of Bontebok National Park and breeding on game farms led to the current population of over 2,000 existing throughout southern Africa. 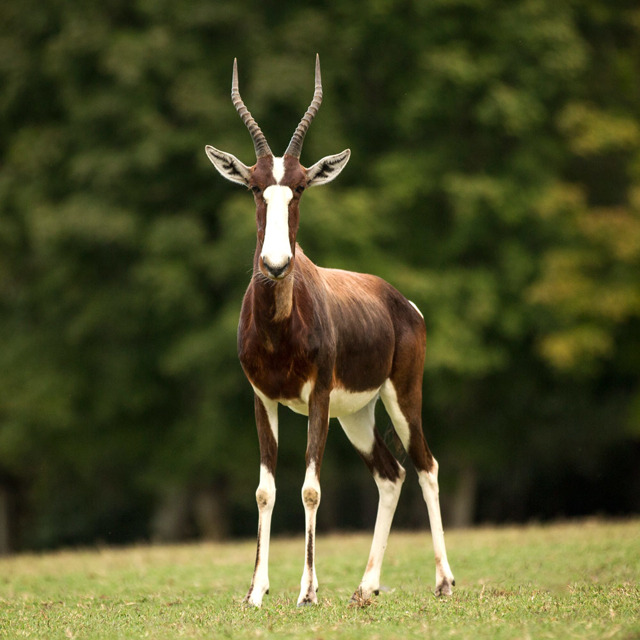 Their current conservation status includes the closely related blesbok of which 250,000 exist. They graze during the day on grasses in small groups of about 10. Males will mark their territory with dung and participate in challenge rituals with neighboring males. Both males and females will grow horns. We participate in the Bontebok Species Survival Plan®. Cape porcupines are the largest porcupines and one of the largest rodents in the world. 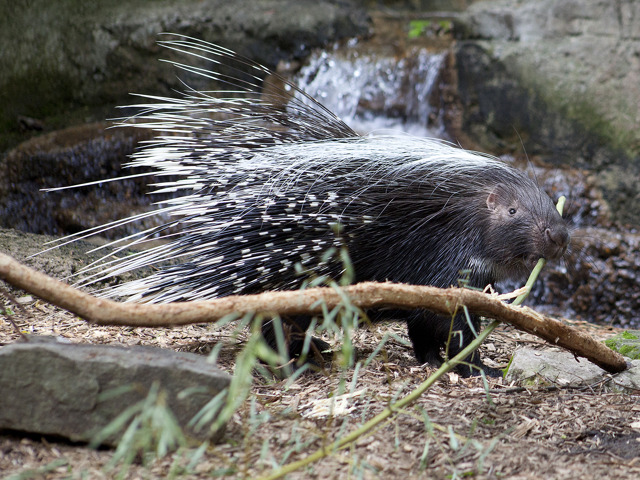 Despite popular belief, porcupines cannot shoot their quills. When threatened porcupines will raise their quills to appear larger. If that does not work they will stomp their feet, click their teeth, and rattle their quills. As a last resort, they will ram a predator with their quills, causing them to be lodged in the skin of the predator. We participate in the Cape Porcupine Species Survival Plan®. 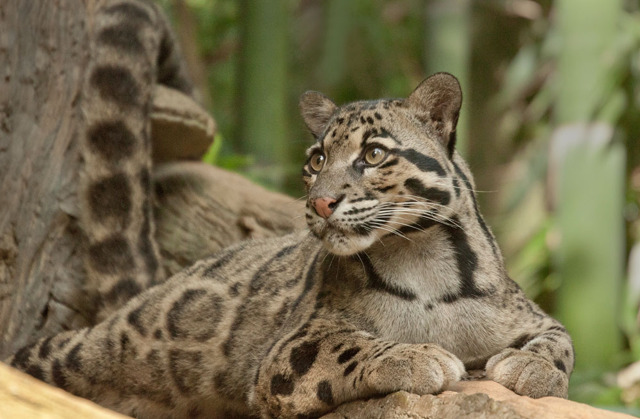 Clouded leopards are the top predators in their range and help control populations of prey species. They are solitary hunters active largely at night. Similar to other leopards they are great climbers and can usually be found in trees which they use to hunt and as resting places. Little is known about their breeding behavior but it is thought that they can mate year round. You can visit our clouded leopards on the Bamboo Trail. Nashville Zoo is a leader in clouded leopard conservation. We are a founding member of Clouded Leopard Consortium and participate in the Clouded Leopard Species Survival Plan®. Cotswold sheep are long wooled that are adapted to areas with high rainfall and abundant food. 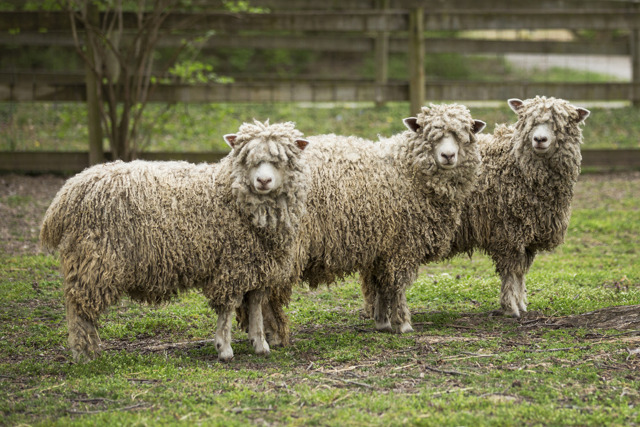 They are considered a long wool breed because they can grow 10-12 inches of wool per year, that equals 15 pounds of wool each sheep can grow per year. This curly white wool is popular with handspinners who turn the wool into thread. Cotswold sheep are a heritage breed with less than 5000 remaining in the world. You can visit our sheep at the Historic Farm. 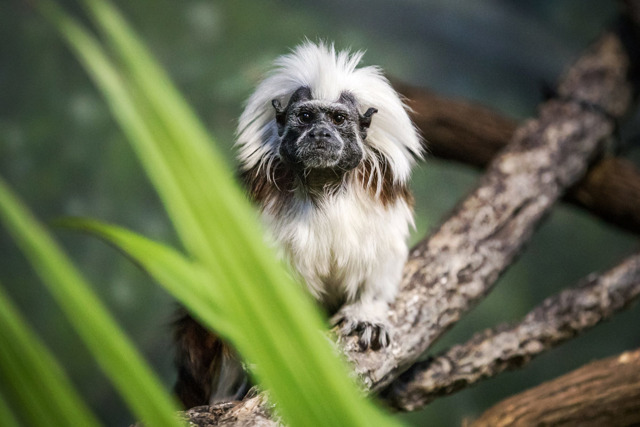 The cotton-top tamarin is one of the most endangered South American primates and gets its name from the mane of white fur around its face. These social primates live in family groups of 3 to 13 individuals and can produce over 38 vocalizations to communicate with one another. Like other tamarins, cotton-top tamarins usually give birth to twins. Both male and female cotton-top tamarins participate in caring for young, with male parents taking turns carrying young so females can forage and feed. Cotton-top tamarins are critically endangered due to threats from deforestation and the pet trade. You can see our cotton-top tamarin in Expedition Peru: Trek of the Andean Bear. We financially support cotton-top tamarin conservation through the Proyecto Titi and participate in the Cotton-Top Tamarin Species Survival Plan®. 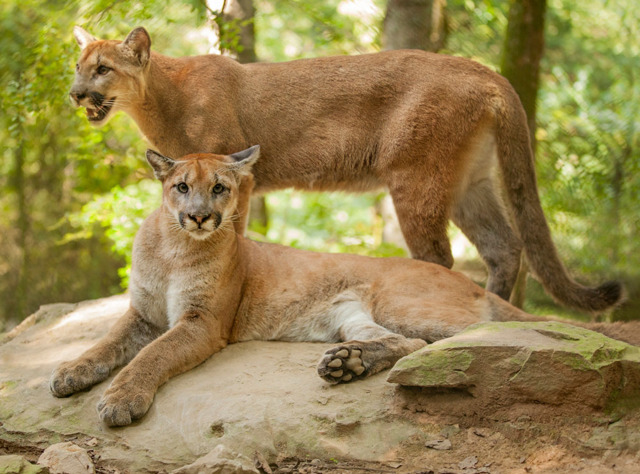 Cougars, also known as pumas or mountain lions, are solitary animals mostly active at night. At one point, cougars had the largest range of any mammal in North and South America. With the increase in human population that range has shrunk to mostly mountainous regions of the western United States. Males will have a home range of about 150 square miles which will include several females. Cougars will not mate until they have their own territory and then breeding can take place year round. Females will have 1-6 cubs and breed every 2 years as cubs can remain with their mother for more than a year. Cougars can catch large prey which they can drag over 900 feet from the place of capture to feed. They often bury their kills to feed at a later time. We participate in the Cougar Species Survival Plan®. Eland are one of the largest hooved animals in the world. They are very adaptable animals with the ability to live in all environments except deserts, forests, and swamps. They are some of the slowest antelope, running only 25 miles per hour. Eland will live in herds of up to 25. There may be more than one male but only the dominant male will have access to females for breeding. Calves are born after a 9 month gestation period and hide after they are born for protection. 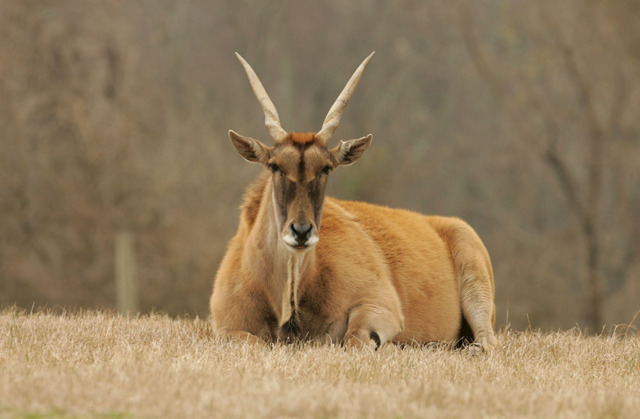 We participate in the Eland Species Survival Plan®. Goats began to be domesticated for agricultural purposes more than 10,000 years ago. They are used for a variety of purposes including their milk, meat, and hair depending on the breed. Females called does often give birth to twins and can have up to 4 kids at a time. Similar to several other hooved animals, goats have a 4-chambered ruminating stomach. This works by the goat eating food, which spends time in the stomach, and then is regurgitated to be chewed again. This helps to produce very little waste and allows goats to get all of the nutrition possible out of their diet. Despite popular culture goats will not eat everything, they are actually quite picky. However goats are extremely curious and will chew on new things to help figure out what they are. 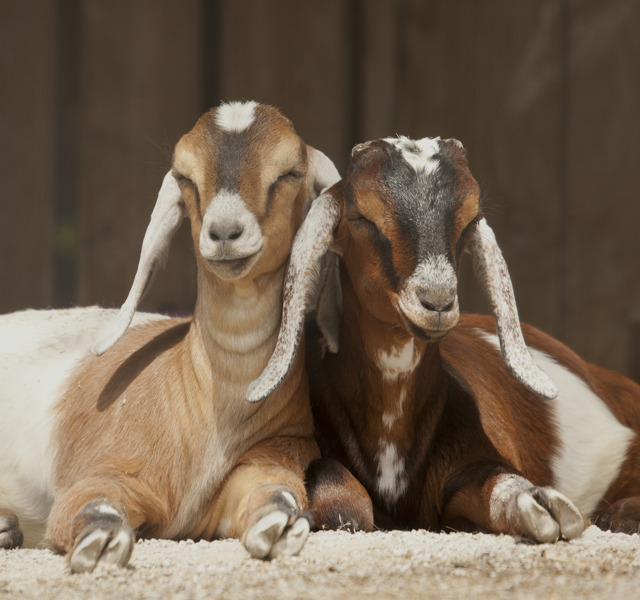 You can see several breeds of goat including: Nigerian Dwarf, African Pygmy, Alpine, La Mancha, Toggenburg, and Nubian goats in the Zoo's Critter Encounter area. There are at least six different types of giraffes. 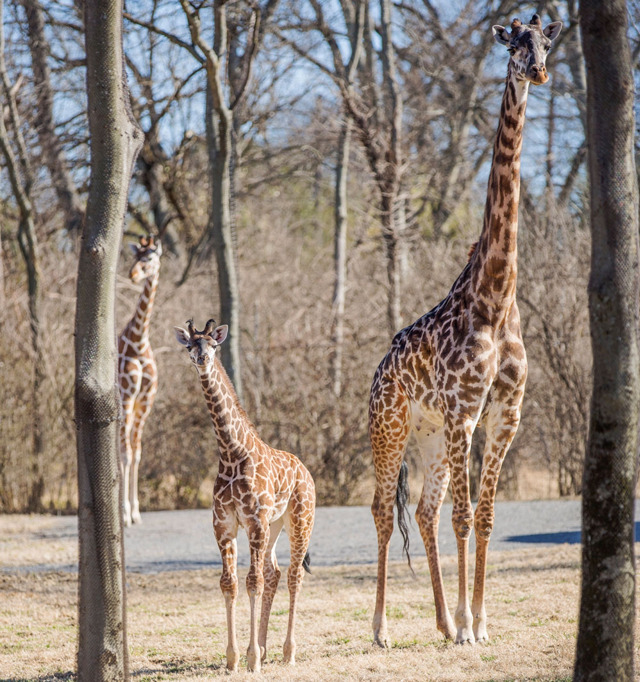 You can see one here at Nashville Zoo: Congo, Margarita, Enzi, and Nyla are Masai giraffes. Giraffes are the tallest of all land mammals. Giraffes have a neck that is 6 feet long and weighs 600 pounds. Their heart is 2 feet long and weighs 25 pounds. They eat about 75 pounds of food each day which they gather with their 18 inch long tongue. Due to this massive size giraffes do not really need to hide from predators, they do need to be worried about lions, but giraffes have a powerful kick that they will use to defend themselves. You can find our giraffes on the African Savannah. We financially support giraffe conservation through the Garissa Giraffe Project and participate in the Masai Giraffe Species Survival Plan®. Surprisingly, guinea pigs are not related to pigs, nor did they originate in Guinea. Though they no longer exist in the wild, guinea pigs are cavies indigenous to South America, with fossil records dating back to 9,000 B.C. Domestication began around 5,000 B.C. for food by tribes in the Andean region and remain a popular food source in South America today. There are 13 recognized breeds of guinea pig, and each is characterized by differences in hair color, texture, sheen and patterns present. Guinea pigs are very social animals and are popular as household pets in Western societies. 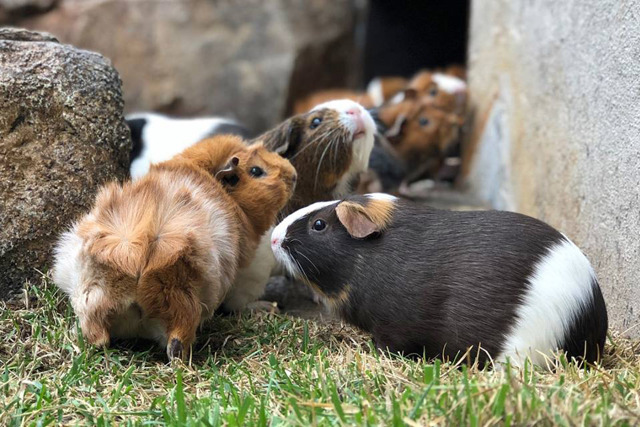 You can see our Abyssinian, Peruvian, Teddy and American guinea pigs at Expedition Peru: Trek of the Andean Bear. Meerkats are small mammals related to the mongoose. 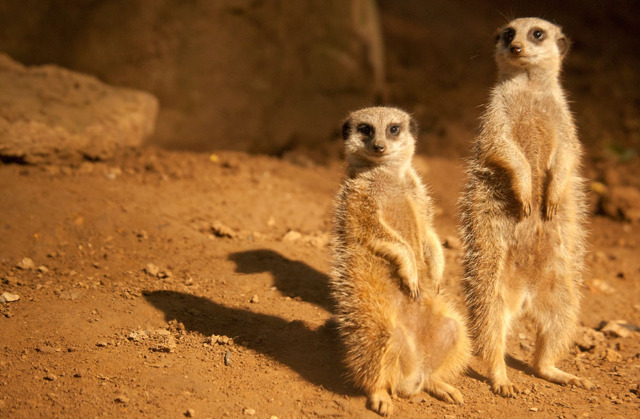 They live in underground burrows with up to 40 meerkats in groups called mobs. This large social group is key to the meerkats survival. You will see at least one individual on “sentry duty” looking out for predators while others will spend time grooming and playing together to maintain their tight bond. Meerkats are made for digging and can excavate huge burrow systems with many different rooms that provide protection from predators. These burrows can have 15 entrances and they stay a constant cool temperature even in the hot African sun. Be on the lookout for our meerkats near Zoo Central. We participate in the Meerkat Species Survival Plan®. Spider monkeys get their common name for their extremely long, spidery limbs and prehensile tail, which can support their entire weight and is often used as a third arm for movement. Spider monkeys are adapted for an arboreal lifestyle - swinging through the trees with a hand over hand motion called semi-brachiation. Spider monkeys lack visible thumbs which allows for greater ease while moving through the branches. 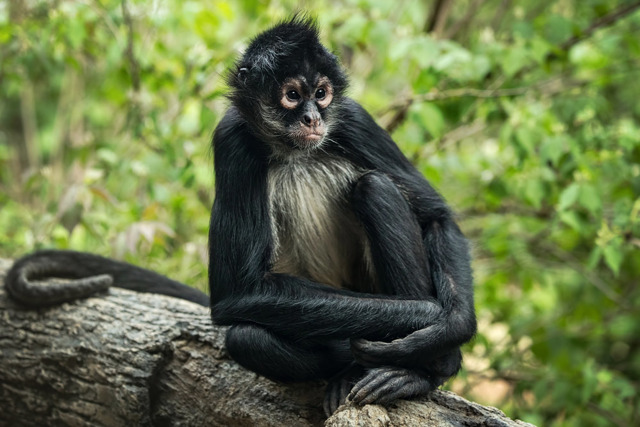 Spider monkeys are critically endangered in the rainforest due to habitat loss and destruction. We participate in the Mexican Spider Monkey Species Survival Plan®. The red pandas were once thought to be relatives of raccoons and bears but research has now put them in their own animal family Ailuridae. Red pandas are solitary and they rarely interact with another red panda outside of mating season. Breeding season is in the early winter with most births being in June. Similar to giant pandas, red pandas have a wrist bone that acts like a thumb to help them grip bamboo. You can see our red pandas on Bamboo Trail. 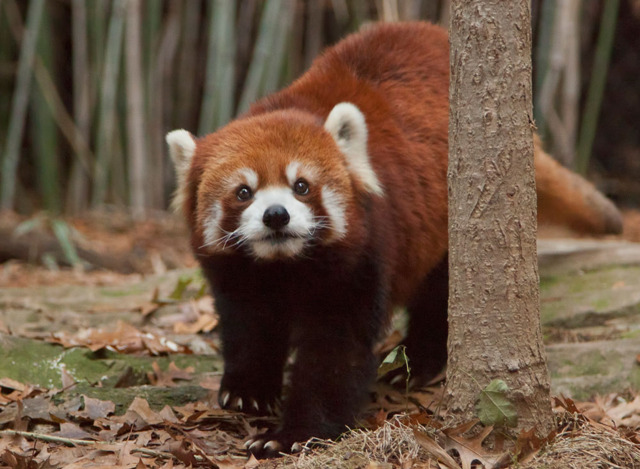 We are a Red Panda Network partner and participate in the Red Panda Species Survival Plan®. We participate in the Red River Hog Species Survival Plan®. Red-ruffed lemurs are 1 of more than 100 species of lemurs on the island of Madagascar. Lemurs are not monkeys but a type of primate called a prosimian. Red-ruffed lemurs will spend most of their day in the canopies of forests and they play an important role in pollination in their habitat. Red-ruffed lemurs are very vocal, with the ability to make more than 12 separate calls. These are used to warn others of predators, keep the group together while foraging, or to warn others that a space is already occupied. Listen for our red-ruffed lemurs on the Bamboo Trail. 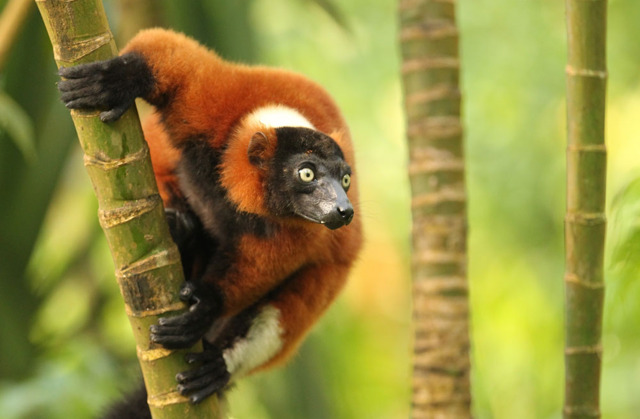 We financially support Sava conservation and participate in the Red Ruffed Lemur Species Survival Plan®. 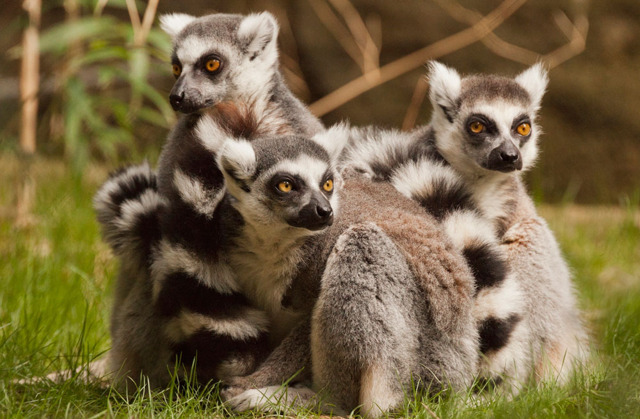 Ring-tailed lemurs live in southern areas of Madagascar in social groups of up to 25 members. These are mixed groups with males and females. Female ring-tailed lemurs are always dominant over males and there is one dominant female in each group. When the group travels together they will raise their long ringed tails to act as flags to locate other members of the group. They will mark their territory by rubbing their scent glands on trees. Breeding usually takes place between April-June with babies being born August-September. Females will usually have 1-2 offspring. You can see our ring-tailed lemurs along the Bamboo Trail. We financially support Sava conservation and participate in the Ring-tailed Lemur Species Survival Plan®. Bats are the only mammals with wings that can fly. Bats are very important to the ecosystems in which they live, as they help to pollinate many of the plants. 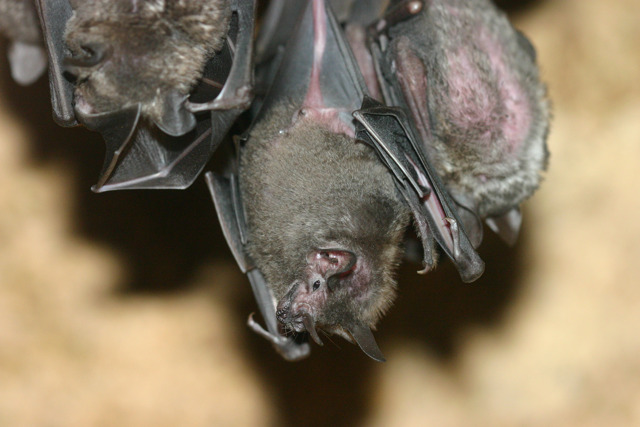 When food is lacking, the short-tailed, leaf-nosed bats will enter into a state similar to hibernation called torpor. Bats will roost in one of two types groups: harems with one adult male and several adult females, or bachelor groups of sub-adult males. Mating can occur twice a year and females will give birth to one baby. Short-tailed leaf-nosed bats love to eat mosquitoes, and you can thank them for that when you see them in the Unseen New World. We financially support bat conservation through Bat Conservation International. 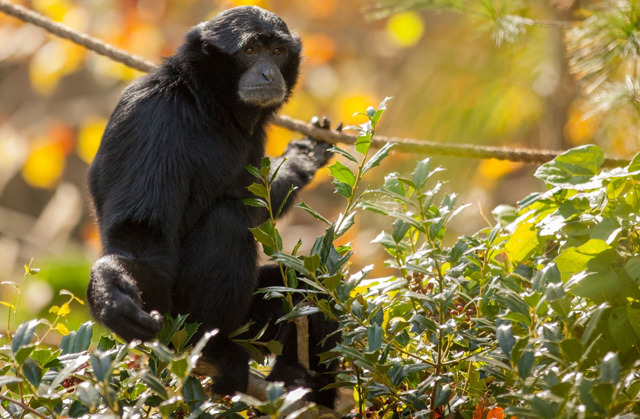 Commonly mistaken for monkeys, siamangs are actually the largest of the lesser ape species. Like all apes, they lack tails and have the ability to move bipedally on their back legs only. Siamangs spend most of their day in trees moving through a process called brachiation meaning they move from tree to tree using only their arms. Siamangs live in a family group consisting a breeding pair and their offspring. Females will give birth every 2-3 years. Siamangs have an enlarged throat sac which can swell to the size of their head to amplify their vocalizations you can hear throughout the zoo! We participate in the Siamang Species Survival Plan®. We participate in the Southern Pudu Species Survival Plan®. White rhinos are one of five species of rhinos that can be found in Africa and Asia. White rhinos can be identified by their “square lip” which enables them to graze on up to 120 pounds of grasses a day. They are active during the day but will find shade or mud to cool off in during the hottest parts of the day. Rhinos are known for their horn which can grow to nearly 5 feet in length, but this horn made of keratin is also what has rhinos at risk. There has been a 9000% increase in rhino poaching since 2007. Anti-poaching rangers have been deployed across Africa to protect rhinos, some rhinos are being moved by helicopter to protected lands, and the US Fish and Wildlife Service has conducted undercover busts of smuggling operations throughout the United States. You can find our white rhinos on the African Savannah. 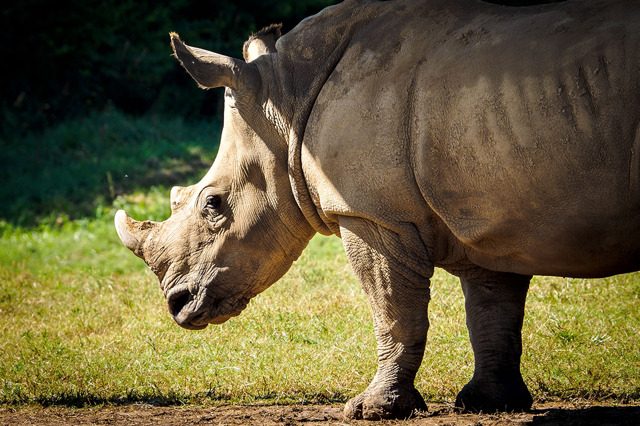 Nashville Zoo financially supports rhinoceros conservation through Lewa Conservancy, which has over 60,000 acres in East Africa protecting rhinos and other species, and the International Rhino Foundation. We also participate in the Southern White Rhinoceros Species Survival Plan®. Huge herds of springbok used to roam the southern African plains, but the springbok is now largely confined to reserves. One of the distinguishing features of springbok is a fold of skin that runs down its back. When the springbok is excited this flap of skin can be opened to display a crest of white hair. 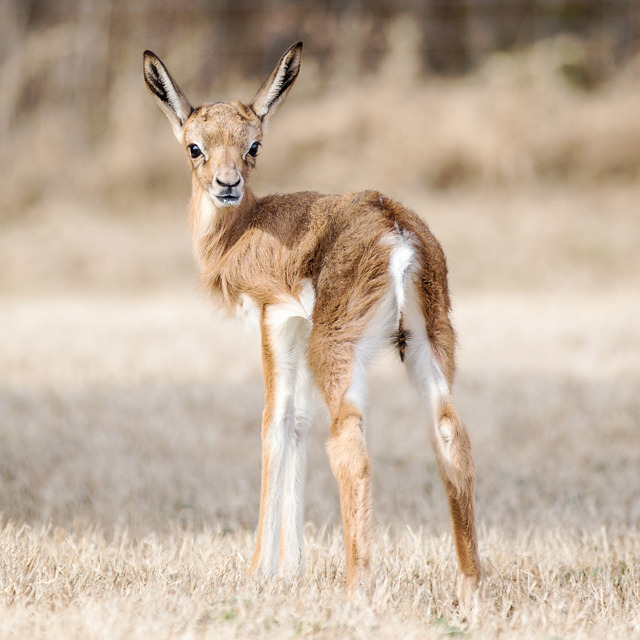 This skin is used in a springbok behavior called "pronking," where springbok will do several stiff-legged jumps up to 6 ft. high while showing off this white crest. This behavior could be a response to predators, to help springbok orientate themselves in their surroundings, or it could have a social role. Both the males and females have horns of up to 19 in. which can be used for defense. We participate in the Springbok Species Survival Plan®. Two-toed sloths are animals of extremes. They sleep 15-20 hours a day, climb 6-8 feet per minute, take 1 month to digest food, use the bathroom every 4-8 days, and have one of the lowest body temperatures of any mammal ranging from 74-92 degrees depending on their environment. Little is known about sloth reproduction but babies begin to eat solid food at 1 month old and will become independent at about 9 months old. They reach full size at 2-3 years of age. Sloths have poor sight and hearing but a great sense of smell. 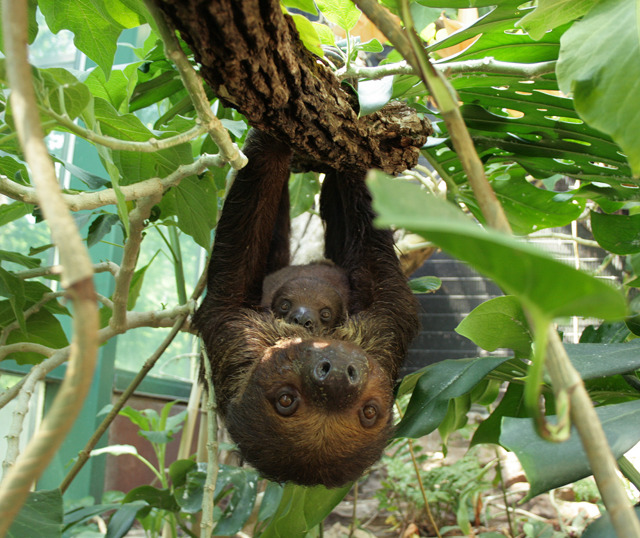 We participate in the Linne's Two-toed Sloth Species Survival Plan®. Gibbons are not monkeys, but are considered lesser apes due in part to their lack of a tail and ability to walk bipedally on their back legs. Gibbons move through the trees by a process called brachiation which involves swinging using only their arms. 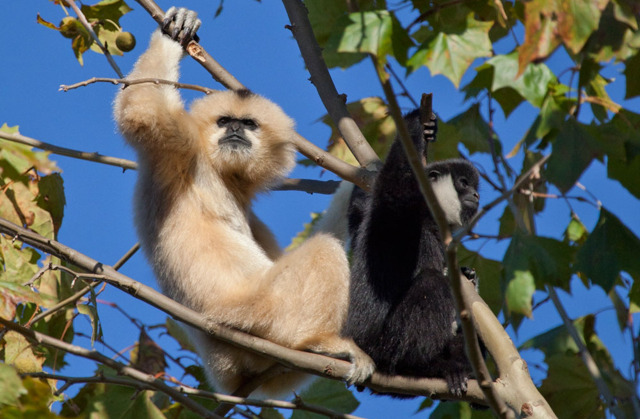 Gibbons live in a family unit of an adult male and female and their offspring. The adult female is the dominant member of the group. White-cheeked gibbons are born blonde to camouflage with their mother and then turn black as juveniles. Females finally turn back to a blonde color at sexual maturity while the males stay black. You can see our gibbons on Gibbon Island near Entry Village. We participate in the White-cheeked Gibbon Species Survival Plan®. Yellow-backed duikers are the largest of all 15 species of duiker. 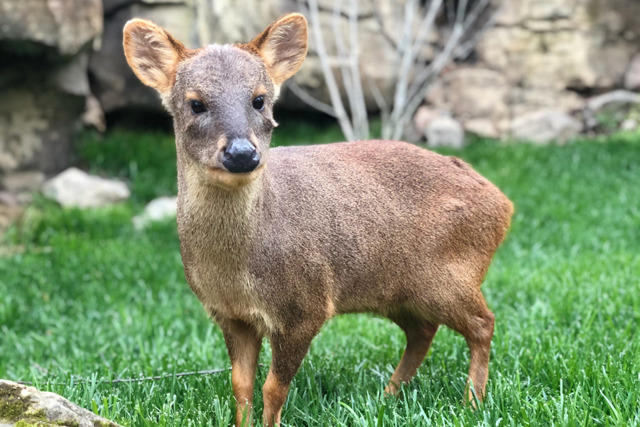 Adult duikers have black coats with a white face. Their yellow hair appears on their back at 5-9 months and stands up when the duiker feels threatened or agitated. Little is known about the yellow-backed duikers’ behavior due to their shy nature and the thick forests they call home. Duikers might be solitary or live in a monogamous pair. They can breed anytime and typically have offspring twice a year. Young duikers are hidden by their mothers in underbrush for the first several weeks of their life for protection from predators. Due to their size, duikers have to forage for food for much the day. 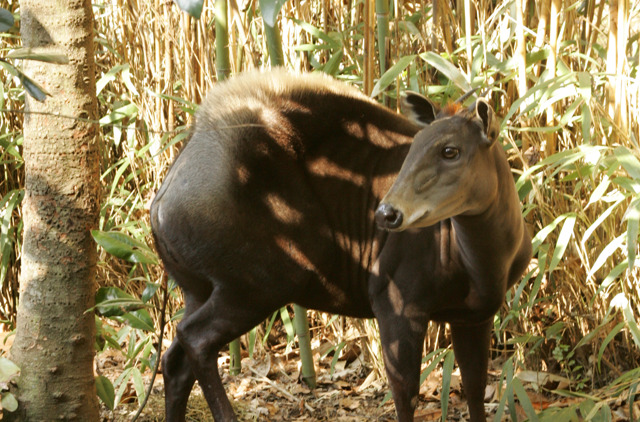 You can see our yellow-backed duikers on Bamboo Trail. We participate in the Yellow-backed Duiker Species Survival Plan®. Zebras are members of the equid family which includes horses and donkeys. They are largely grazers and eat the tops of grasses were they live. Each zebra has a different pattern of stripes on their coat. This is called disruptive camouflage. The main predator of zebra are lions who like to hunt for zebra as the sun goes down. Zebra’s stripes help them to blend into tall grasses where they live and confuse the lions. Zebra live in large herds and their stripes make it hard for lions to track a zebra to hunt for a meal when following a large herd. They also have other defenses against predators including great hearing and eyesight, a top speed of 35 miles per hour, and a kick that can seriously injure a predator. Zebra can give birth anytime during the year and will usually give birth to one foal which stays with their mother for up to 3 years. You can see our zebra on African Plains. 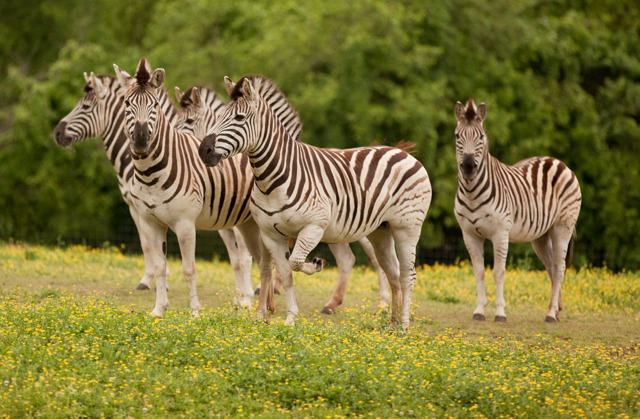 Nashville Zoo financially supports zebra conservation through Lewa Conservancy.